Some web platforms, like Apache Tomcat and Voxeo Prophecy, require their configuration files to be kept in specific locations under the platform’s installation folderpath. This creates a minor annoyance when developing for these platforms, because your IDE may not be able to add such a folderpath to its workspace. But even if the IDE can access such a folderpath, or even if you can create a symbolic link to it, the IDE might add project-related files that would confuse the web platform. As a workaround, I’m using FreeFileSync to define rules about which items from the two folders should be overwritten by newer files from the other folder. 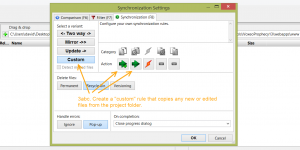 However, FreeFileSync only syncs when prompted to via its GUI. To automatically detect new files and trigger sync, you can use the companion app RealtimeSync (which is included in the FreeFileSync installer). Yet, RealtimeSync is an app rather than a service, so you need to configure Windows to launch it whenever you start Windows or resume from sleep. This app’s sourceforge page has a download button, but it will lead you through several hops before you get to a mirror at “FossHub”. The download links can be hard to find. Look in the light blue box near the top for a set of links such as “Download FreeFileSync for Windows”. During the installation, avoid Express install because it will install bloatware; use Custom Install instead. These steps are adapted from another guide. 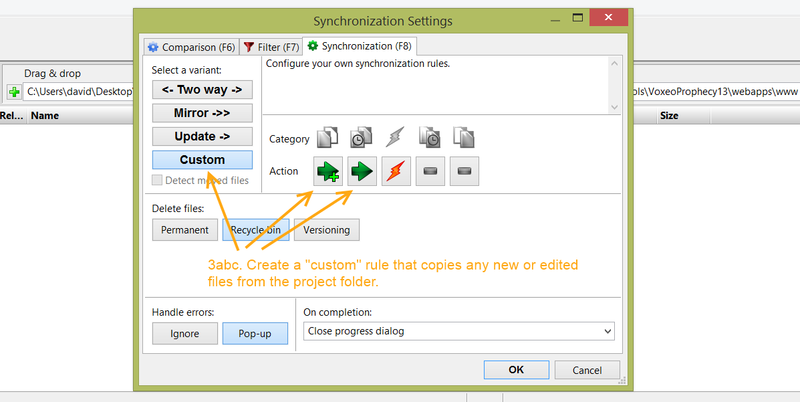 In FreeFileSync, click the small green ‘+’ button above the left file listing pane to add as many pairs of folders to sync as you need. Cause new items in the left folder to be copied to the right folder. Cause edited items in the left folder to overwrite the corresponding file in the right folder. Note that only files introduced after RealtimeSync is first started will count as “new”, which is a good thing if you don’t want all the files in the left folder copied over. I recommend creating a top-level Dropbox folder called Settings where this batch-settings file can be kept. Go to Program | Open and select the batch-settings file you just created. Use Windows+Q to open the start menu search box, enter “schedule”. Either “Schedule tasks” (in Windows 8) or “Task scheduler” (Windows 7 and before) should be offered. Select it. In the app that appears, select Create Basic Task. Under Conditions, make sure there are no dependencies on idleness, AC power, etc. Logout of your Windows session, then log back in. Edit one of the project files and save it. The FreeFileSync dialog should appear within a second or two, and disappear within a second. Verify that the corresponding file in the web platform folder has the edited content. This entry was posted in MSWindows, Source control, Tools on May 19, 2014 by david. This entry was posted in MSWindows on December 6, 2010 by david. Update: SORRY! It turns out that VirtualBox ties its configuration very closely to specifics of its host machine (such as through the MAC address), so I have to back away from the “portable” claim in this post’s title. Until VirtualBox realizes the value to them of supporting portability, using VirtualBox won’t actually help you go portable. There is a framework called qemu that allows running an entire operating system from a thumbdrive, and it can do so in a mode that doesn’t require admin privilege. But this mode can’t access USB peripherals like keyboards, mice, and other drives connected to the host computer. The final deciding factor against qemu for me is that OSs make many writes to the storage they boot from, and thumbdrives allow only thousands of writes before their storage capability degrades. Because qemu would not be able to use usb-connected keyboard and mouse, because I’d have to copy it to a new thumbdrive fairly often, and because it would be pretty slow by most accounts, I decided to give up on the “no admin privilege required” goal. Instead, I asked my IT dept to install VirtualBox. The following steps were inspired by a Lifehacker post. Get a portable hard drive. I got a Maxtor 160GB “Basics” model for about US$60. Plug in the drive to any machine you plan to use where you don’t have full control, then check that you can write to it. (For example, right-click in the drive contents shown in Windows Explorer and choose New | Text Document.) If you can’t write to it, ask your IT dept to grant you write permission for it. Have VirtualBox installed. Then copy its .VirtualBox directory to your portable hard drive. Start VirtualBox and go to File | Preferences | General. Change “Default Hard Disk Folder” and “Default Machine Folder” to .VirtualBoxHardDisks and .VirtualBoxMachines on your portable drive. In VirtualBox, press the New button. Click through the Next buttons, including leaving virtual memory at 512M. Take a lunch break while the VDI is created. I also created a brief “reward if returned” text file with contact info at the root of the portable drive. Once your virtual drive is created, click the Settings button, then the CD/DVD tab and the Add button, and browse to the ISO file of the OS you want to run in the virtual machine. For me, this was Windows 7 RC and my “host” is Windows XP. Click Ok and return to the main VirtualBox window. Click the Start button. You should eventually see the OS installation prompts. Answer the prompts the way you would if you were installing to a machine sitting right next to your current one and on the same network. Once the OS is installed, you can move or delete the ISO file. If VirtualBox complains about not being able to find the ISO file, just use the button to remove it from the CD/DVD mounts. Turn on sharing for each of the folders you want to access. To make the shared folder appear among the drives shown under Computer in your VM OS (“the guest machine”), go to the Start menu, type in “cmd”, and then type in “net use s: \vboxsrvMyHostFolder” where MyHostFolder is replaced by the name of a folder you shared, and where s: is replaced by a drive letter not already in use. You should now be able to copy all the data folders from your host to the guest. Do not install an antivirus program. They can make your guest unusable by turning its display to snow and ignoring your commands. This is the most significant sacrifice I’ve encountered so far. Use Mozy to backup your data. The first 2GB is free, and you won’t have to remember to backup again. Set built-in Windows Defender (anti malware) to run everyday over lunchtime instead of at 2am, since the portable drive may be disconnected overnight. Media players like Winamp stutter when run in a VM. I run them from the host instead. Whenever you need to take the portable drive with you, go to Machine | Close | Save Machine State. All your open windows and state will be saved and the VM will close. Quit VirtualBox so it doesn’t hold onto the VDI file on the drive, then unmount the drive via Safely Remove Hardware. If something still won’t let you unmount, then you may have to shutdown the host. I have been closing down my VM every night, because when I’ve allowed it to run for several days before shutting down, VirtualBox seems to get stuck in a “stopping” state. It’s not clear if this is a bug in VirtualBox or a behavior in Windows 7 that can be configured not to happen. Wishlist: An official theme that matches my Windows default theme! Google Calendar gadget. Move to lower right corner. This entry was posted in MSWindows, Tools on May 26, 2009 by david. I wasn’t able to find instructions online, but a SingTel rep sent me a PDF, and I’ve uploaded it to scribd.com so you canÂ read the instructions as a regular webpage. This entry was posted in MSWindows, PIM on March 7, 2009 by david. Parser Error Message: It is an error to use a section registered as allowDefinition=’MachineToApplication’ beyond application level. Â This error can be caused by a virtual directory not being configured as an application in IIS. After many failures to install VS2005 on my laptop, I got a second machine and reinstalled XP (and drivers) in order to bypass any app conflicts. This wiped out McAfee (which was part of the install image), and the XP install turned on its firewall by default in response. I hadn’t noticed that the firewall was on, and when I tried to get IIS to serve a simple xml file from its doc root (c:inetpubwwwroot), only the hosting machine could access it. Yet ping from other machines to the IP name worked. I looked in the IIS access log at c:Windowssystem32LogFilesW3SVC1ex*.log, and there weren’t even any access attempts from other machines shown. Googling “The page cannot be displayed” revealed the firewall involvement. To disable the firewall, Start|Run, and enter “Firewall.cpl” and follow the prompts. This entry was posted in MSWindows and tagged FilterKeys on November 2, 2007 by david. This entry was posted in DHTML, MSWindows and tagged DHTML, IE on November 2, 2007 by david.